KitchenKraft is a family business owned and operated by family members since 1963. We have been designing, manufacturing and installing kitchens for 5 decades. Our factory has the latest computerised manufacturing machinery, which allows us to build each individual kitchen to suit your space, style and taste! 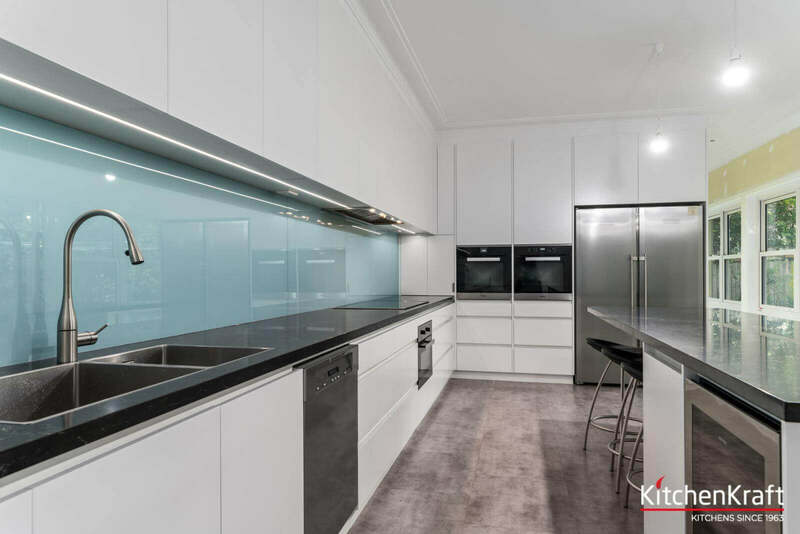 KitchenKraft has the manufacturing ability to build every individual kickboard, cupboard, drawer and benchtop to suit your room and your style. If you are after a modern streamline kitchen with no handles or a traditional style we at KitchenKraft can help you. Higher or lower benchtop to suit your needs. Deeper benchtop to provide more benchtop space and deeper cupboards and drawers. Different benchtop thicknesses to suit the style of the kitchen. Any drawer height you wish to accommodate your kitchen items. Lower or higher kickboards to suit the style of the kitchen. Height of the upper wall cupboards can be varied from ceiling fixtures, bulkheads or space on top of cupboards for extra storage. Complete flexibility on the overall height of the kitchen. BLUM has 4 different new styles of drawer runners on display in our showroom.